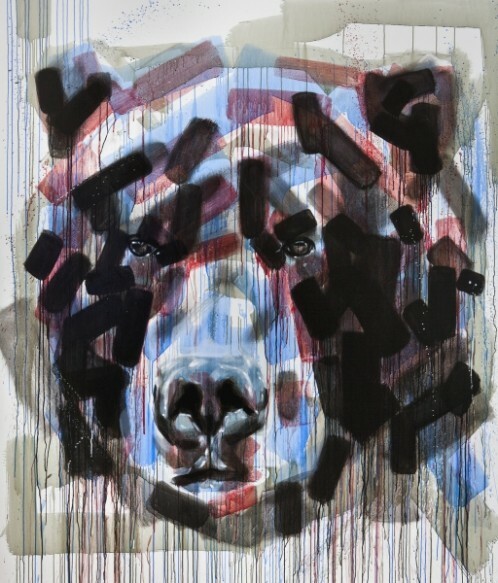 Through this latest body of work Chad Hasgawa explores the relationship of creative influence and output, utilizing techniques of artists he admires while staying within a narrow constraint of subject matter with each painting being of his trademark grizzlies. Attempting to capture the spirit of some of the twentieth century’s favorite masterpieces is an ambitious goal and Hasagawa faces it with an unyielding energy. Working almost exclusively with mistints (custom colors that have been incorrectly mixed and discontinued) Hasegawa challenges himself to create color palettes that recall notable pieces by abstract expressionism’s greats through colors that have been deemed a mistake. 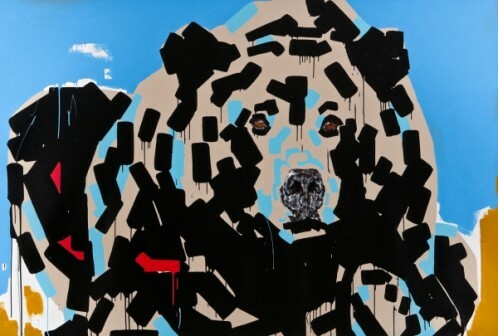 From the murky swirl of navy, teal, black and cream of Leo Valledor’s “Whose Blues” to the tactile, forceful brushstroke of Kline’s predominantly black and white “Lehigh V Span,” Hasegawa gives a nod to the distinctions of each masterpiece as well as the visceral charge that binds them.